Here is a complete guide to Marketing research, all you need to know, why you need it and how to get started easily and fast. Do you really want to set up a successful business venture? If yes then relevant Marketing research is needed for good decision to be made in your business plan. As an entrepreneur or a businessman, you need to find out or know how your target market responds to your marketing mix - product, price, promotion and place (distribution). 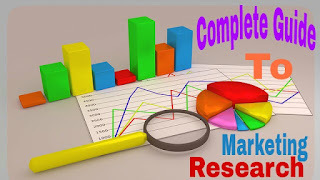 Marketing research is the process of identifying the information to try to determine what it tells you about the customers, competitors, or market that you are in, and then doing something in your business based on that information. -To know whether your target markets like your product or not. -To know whether your customers are comfortable with the price of your products. -To uncover insights into your marketplace to know whether both existing and new customers (buyers) are aware of the existence of your products. -To know whether they can get your products where and when they want them. These are some of the reasons why you need to conduct a relevant marketing research for your target market. Apart from the information about your target market, you also need information about your competitors - their products, price, strategies, and generally how they react to your own marking mix. You also need information about the environment in which you operate your business so that you will know how to cope with environmental factors. That's why market research is so important for a start-up business. All these information do not just come without searching for them. You have to go for them through what is called marketing research. That being said, Marketing research is extremely important for companies looking for a process to uncover insights into their marketplace. Identify precisely the information that you need in order to make the correct decision. This is the first step in marketing research. All you need to do is to clearly identify the problem and the information that is required to solve that problem. Be careful not to mistake a symptom for the true problem. For example, a reduction in sales volumes is not a problem, rather it's a symptom. So many factors may be responsible. Is there new competition? Are the salesmen impolite or unknowledgeable? Have customers tastes changed? Do customers have difficulty in finding what they want? Answering these questions will definitely assist you in indefying the problem and the exact information that you need to skyrocket your business. Find out what information already available that you can use: Once you decided on what information you need, the next step is to find out what information is already available for you to use. We're referring to secondary data or information. You can get it from within or outside your business. Determine what if you will have to get on your own: Every effort should be made to collect all the secondary information or data that is a but if it's not enough or not the right information, you will have to get information on your own. This is called primary information or data. You can get primary information or data through observation, interviews, mail survey, and focus groups studies. Organize, summarise, and interpret the information or data collected or generated: Here, you are to collate, analyze and interpret the information that you have gathered. You can use tables, chats, and other visual aids to make it easier to see and understand what the information is all about. Make a decision based on your information: Many businessmen make decisions based on what they feel or think alone. That's not too good. You have to make decisions based on the information available from your marketing research. Be careful so that you use the information to make decisions regarding operational aspects of your business, such as products offered, prices set, location of the business, message to use in advertising and the like. Conducting marketing research is extremely important in any form of business whether you have all the information or data available. By doing a relevant research you will likely uncover new opportunities and messaging tips to help improve your interactions. Thanks a lot for a well-researched article. I really like your opinions and recommendations! They are indeed helpful!